This week due to the hollow tining program we have played away twice, firstly at Mar Menor on Wednesday (society prices) and on Friday we tried out Corvera. 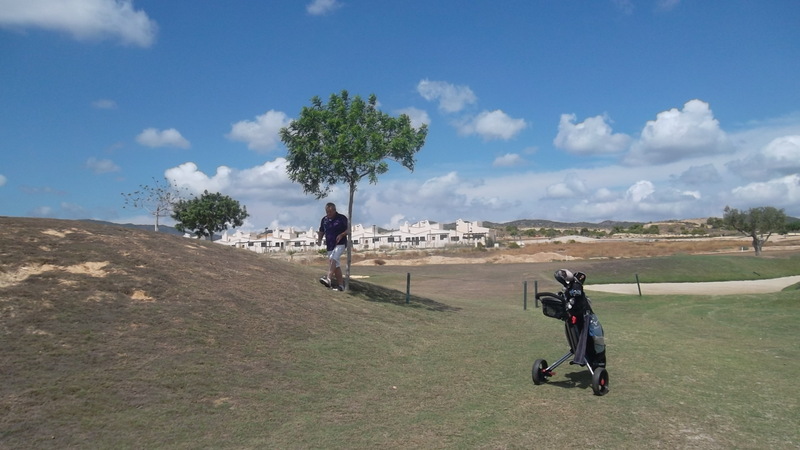 Mar Menor was in very good condition, although the greens were slow in comparison to Condado. 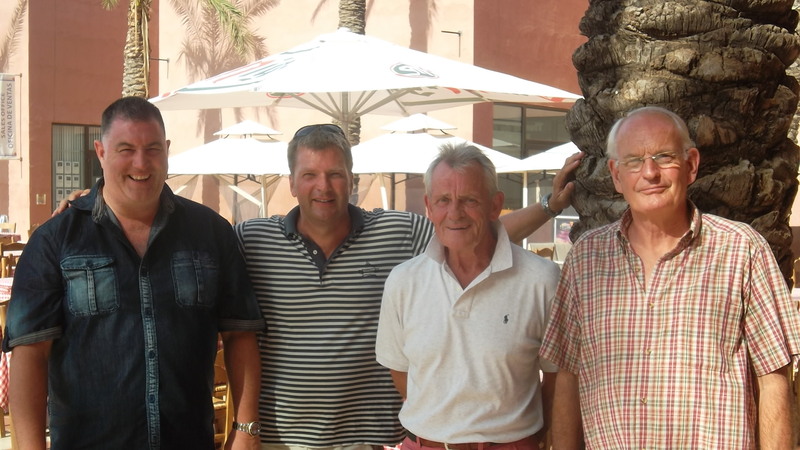 24 players took part in an individual stableford, and the winner was Jim Hershaw with 38pts. Corvera was very cheap at 27 euros (including buggy). 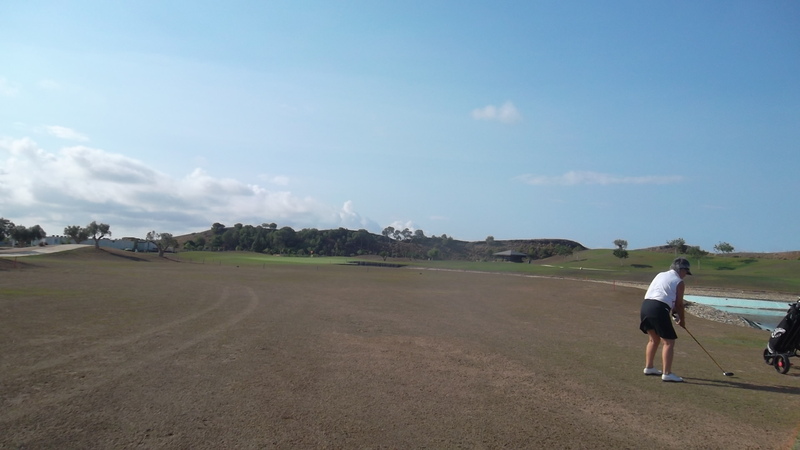 The downpours of the previous few days did nor affect play, although it looks like they could have used the water through the summer months, as the fairways and rough were black (no signs of greenery anywhere). Cuttings from mowing covered the fairways, and the rains had washed them into tidemarks. The greens were in good condition though, if slow by comparison with our course. 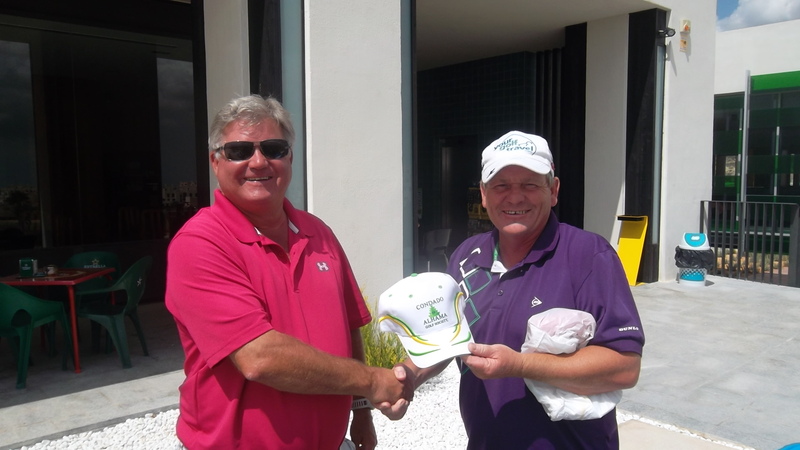 The winner of the individual stableford (29 entries) was Dave Cooke with 38pts. 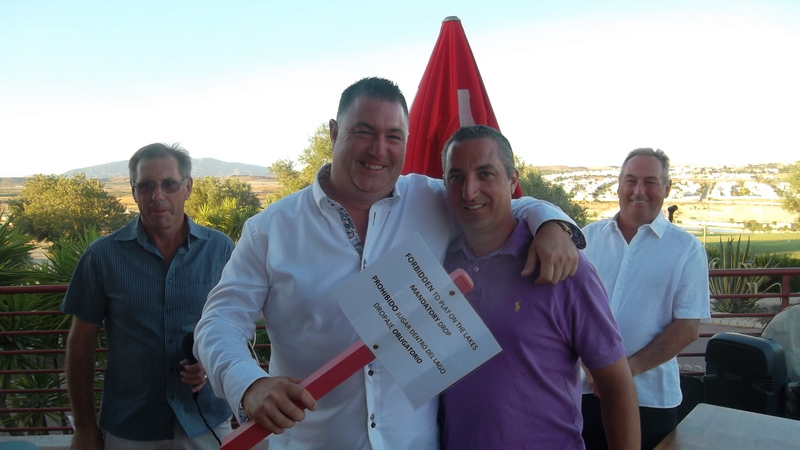 Dave Cooke has had a great week …….reduced his handicap twice!………..
Kevin found a difficult lie at the base of one of the few trees and had to take a penalty……………………….. It was nice to play different courses, but it will be good to get back to Condado once it recovers. Until September 5th greenfees have been reduced to 34 euros for residents. Next week we are back at Condado and will play a 4 person team event. Find below new initiatives to be introduced by IRM. I am excited to announce that IRM Golf Experience now offer 3, 6 and 12 month memberships. Membership includes all 6 IRM Golf Experience courses. A family membership includes children under 18 years of age, maximum of 4 persons. Green Fee price is €5/9 holes and €8/ 18 holes, in Low Season this green fee will be waived. (January, June, July, August and December). This is not available on pre-booked rounds, only booked on the day. This promotion is available starting the 1st of September, 2013 – 31st of December, 2013. Please contact me if you have any questions or wish to join our membership. Also IRM have announced reduced prices for residents until September 5th. It will be 34 euros for residents with 50% reduction on hire equipment (buggies?) due to the effects of hollow tining. 32 players in the fun day, which turned out to be a 2 person texas scramble. It was decided that a reverse scramble would be too complicated and time consuming. No wind at 09.00, but as usual all players finished with a strong breeze making soring harder. Next week the course will be closed due to hollow tining, from 12.00 Monday until Thursday. As a result of this we will have an awayday to Mar Menor on Wednesday. Society rates will apply and if you want to go contact Barbara. All buggies have now been allocated so it will be walking only. Also the fact that the greens will be covered in sand on Friday means we will be travelling again, this time to Corvera, with a great rate of 27 euros with buggy. Again, unfortunately, there is a limited number of buggies and it will be first come first served. The sheet for this is on the noticeboard in the shop. If you want to play Condado on this day please contact the shop (968328008) as there will not be an organised competition. The week after there will be a 4 person team event at Condado. Thanks to Barbara for manning the desk Friday mornings for the last month, but she will recommence playing in September, so we are looking for a volunteer to collect entries and hand out cards. The task can be rotated if we have more than one volunteer. (Non-players please feel free to help us out). I was away last week so can’t comment on the day. 59 players took part. Here are the results. Next week is a fun day, and we have decided to have a reverse texas scramble. This is a pairs scramble but the opposite team can choose which drive you take! Buggies need to be booked through the shop. There has been too much cricitism of the committee who try to allocate them in the fairest way. With not enough buggies available in the summer it looks like it will be first come first served so either call in or ring them on 968328008. Captains day this year produced a record entry of 81 players. Originally there were 90, but 9 did not arrive. 3 of the absentees did send apologies, but the other 6 did cause problems. With only 22 buggies available, 33 players put their name down for one, so some were disappointed. With players missing, some buggies had only one player, which was unsatisfactory when others had to walk in the heat. It may be that non attendance without reason will incur some penalty, but this will need to be looked at by the committee. If it had been a team event further disruption would have resulted with several teams unable to compete. If you can’t attend for any reason ring the golf shop on 0034 968328008. Put this number in your contact list. The staff and organisers did have to put up with complaints about not only the buggy situation, but also the ruling of compulsory penalty drops from the dry lakes. This is a local ruling brought in by IRM to avoid accidents when players slip down the lining when retrieving (or playing) their ball. Also from a fairness point of view some of the less straight hitters deliberately aim down the lake as the shortest route to the green. That can’t be fair! So stick to the rules, and don’t give the committee grief over it! Anyway, rant over and lets talk about the competition. A long day, with players going out from 08.30 until 12.00. Thanks to Barbara Rollett and June Briggs for giving out cold drinks on the 12th tee, which were appreciated by all. There were some fun prizes with nearest the pin and nearest in 2. I played with Owen Moore who was nearest in 2 on the 8th. He chose to drive up the left fairway, leaving a longer shot, but was proved correct when his 2nd shot came in from the left and finished a couple of yards behind the pin. Unfortunately none of the ladies hit the green on their chosen hole so the prize was unclaimed. I would like to thank the winner of the ladies prize, Brita Hoymyr, for attending at night to receive her prize, as she had travelled down from Mar Menor. 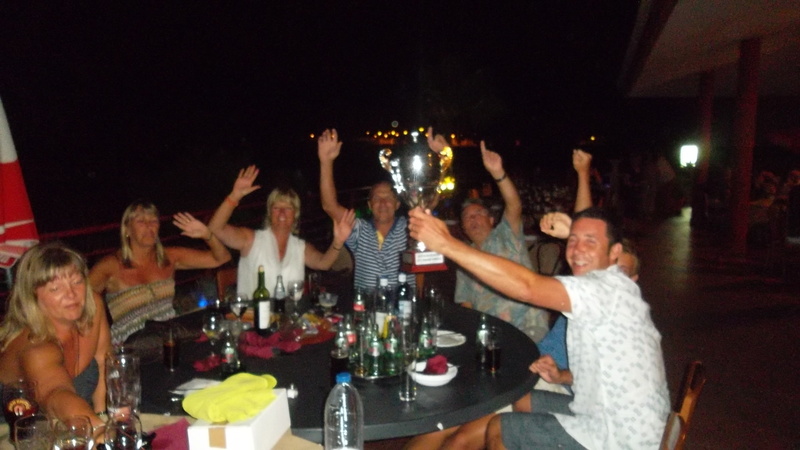 All other winners were there on the night to collect their prizes. James took the main prize………. 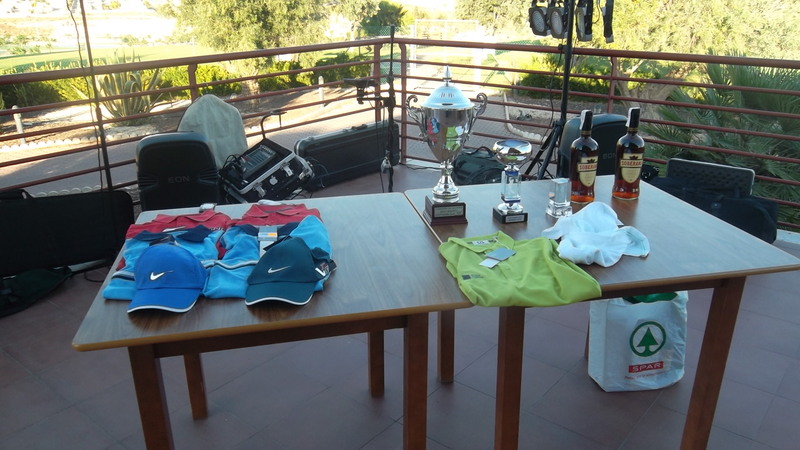 It turned out that the venue of Camposol golf club was an excellent choice. 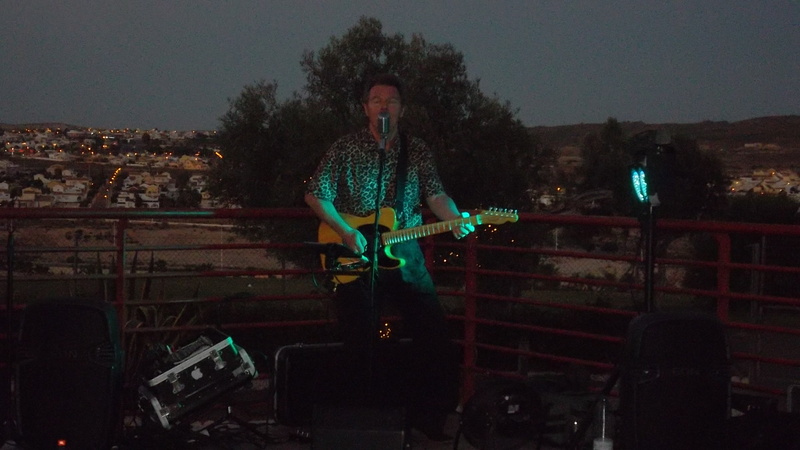 We all sat outside with beautiful views of the surrounding countryside, and later the lights of Camposol provided a stunning backdrop to the music and dancing. 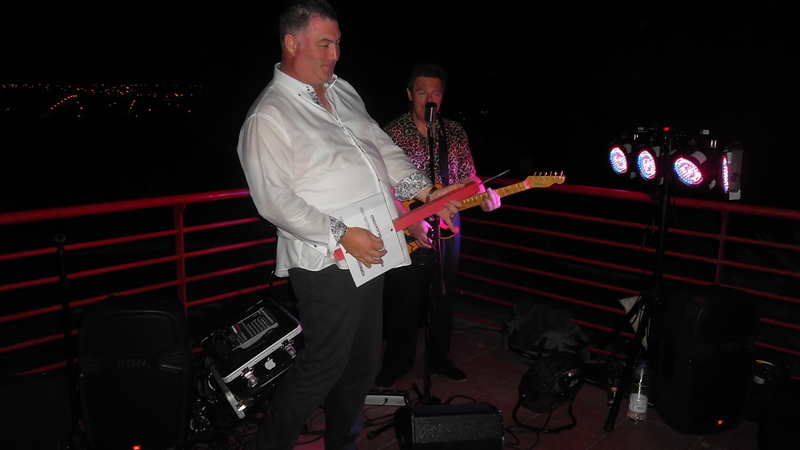 Lenny Mitchell was in fine form with the microphone and had the audience up dancing most of the night. With about 120 society members and families this was again a record attendance. 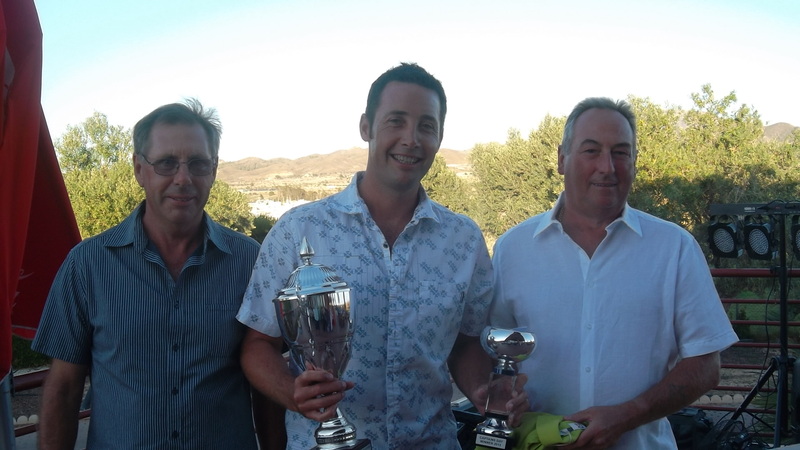 a lot of support for the winners from naranjos 4…..
Next week is the monthly Apollo Air individual stableford competition. The company have extended their sponsorship for a further 12 months, so we appreciate their commitment to the society. We will also trial starting from 2 tees, the 1st and 10th. This will mean that the later starters don’t have to start their round in the blistering heat of the midday sun. The last players should be out from approximately 10.00 instead of 12.00. Post from IRM below. Click on link. Should be good news for the trail and Condado. 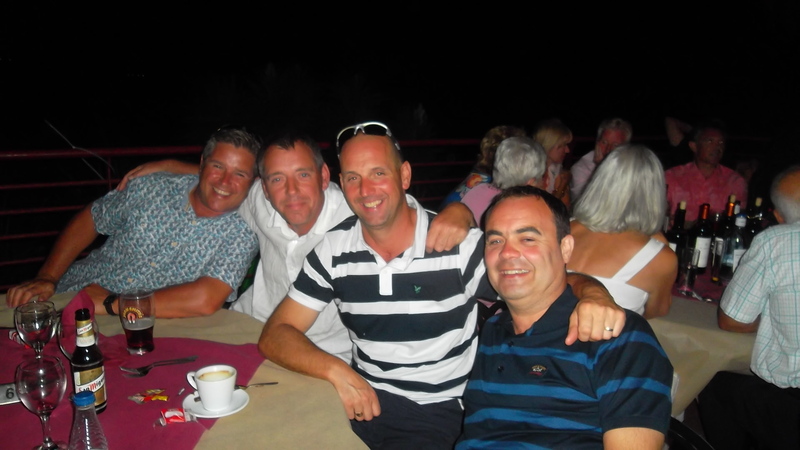 Scott, Graham, Jim and Ray………..
Another beautiful day on Condado. 64 players took part and the scoring was phenomenal! Nice to see lots of new members (now over 500 for the year) enjoying golf on a fantastic course. The winners had an amazing game, producing 11 birdies and 7 pars! An interesting rule query…….. on the 16th I putted from off the green and my ball finished on the edge of the hole with one third of it over the hole. I marked it, then when I replaced it (after my partners had putted up) it kept falling into the hole! I tried about 6 times to replace it but every time it fell into the hole! Eventually I replaced it in a different place (to the side) in order to putt out. Is there anything in the rules to answer this dilemma? One team was disqualified for incorrect placing of the ball under penalty. For example, when in the water (9th or 18th) you have 3 options. You can go back as far as necessary in line with the point of entry and the flag. Once the ball is dropped it is in play, and cannot be picked up again and moved, unless taking another penalty. I have also seen a player taking his ball out of the lake on the 10th and dropping it on the fairway at 90 degrees. It should be point of entry. Another option for a penalty drop is you can drop 2 clublengths from point of entry and it is allowed to roll another clublength (but cannot be nearer the hole). If it is a free drop you are allowed one clublength. We all need to play to the same rules. Another reminder about captains day next week. The sheet is up in the shop. 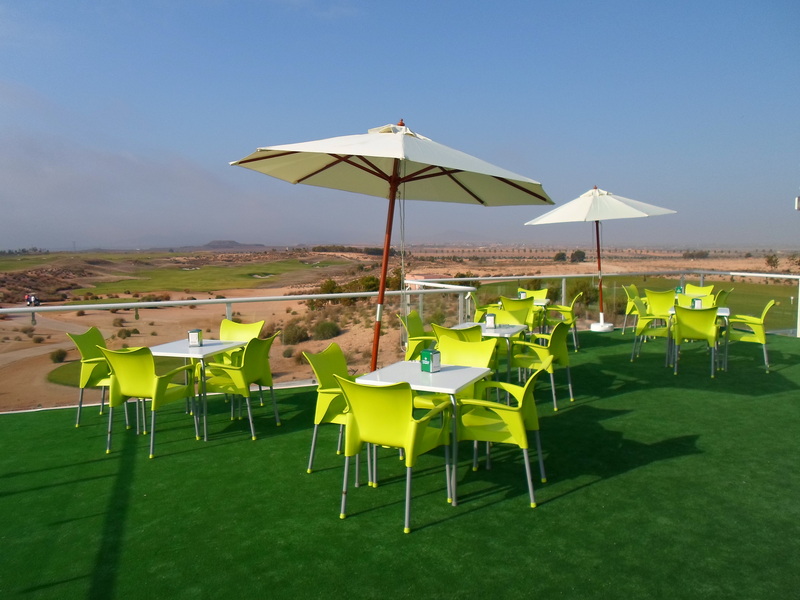 If you want to have a meal at the evening presentation at Camposol golf club it is 12.50 euros. Contact Paul at pdbriggs@hotmail.co.uk. We already have over 100 names! Another benefit has been agreed for IRM members (either 6 course members or those with still some remaining months on Condado membership). Before they could not share a buggy with a visitor paying 45 euros (they had to pay 28 euros for a buggy). This disadvantaged both visitors and members. Now IRM have agreed to their members sharing a buggy with a visitor paying 45 euros for nothing! Members have had little in the way of benefits for the last 4 years so this is marvellous news. Also we have negotiated a reduction in green fees for Captains day and the Viking cup. 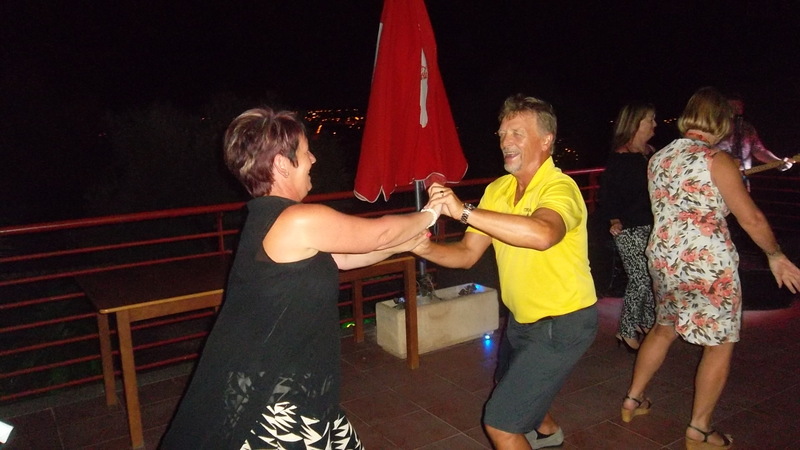 On both days non members fees will be 40 euros with buggy instead of 45 euros. No reduction for members, but they can share buggies.